I used to love the idea of “colorblindness,” imagining everyone equal and not letting race get in the way. 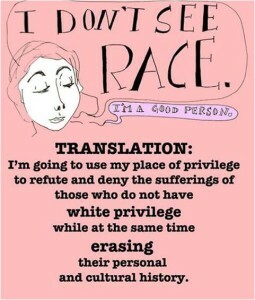 Unfortunately, it turns out that race is in the way and pretending it isn’t is both offensive to people of color who understand firsthand how differently lives play out along racial lines. Ignoring or denying racial difference also guarantees not understanding it enough to join in challenging it. Trying to be nice and kind to everyone is a great start, and it’s not enough. Ignoring race actually maintains the very cycle of silence, ignorance, and denial that needs to be broken for racism to be dismantled. It’s a classic case of good intentions backfiring. Check out these two links to better understand this critical concept.